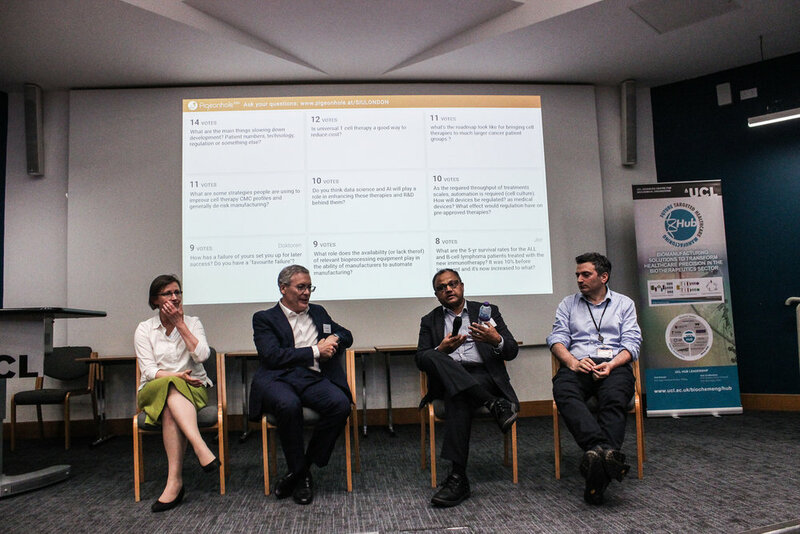 On the 2nd of May, SIULondon launched the event “Advances in Immunotherapy: Innovations from the frontline in the fight for life”. Four prominent specialists in the subject- Gregg Sando, Dr. Martin Pule, Dr. Jacqueline Barry and Dr. Bo Kara - came to discuss the state-of-the-art on the science, technology, manufacturing and public regulation of cell and gene therapy. The event was sponsored by Miltenyi Biotec. Gregg Sando, who is the founder of Cell Medica started by introducing scientific concepts related to immunotherapy. This type of therapy has been explored for cancer, autoimmune diseases, infections, and to avoid receptor’s rejection of an organ after a transplant. The more popular cell types used are T cells, although other cell types such as NK cells, macrophages, dendritic and engineered mesenchymal stem cells are also currently being explored. Two important clinical trials using Kymiah and Yescarta drugs were mentioned. They showed impressive percentages (>50%) of complete response in lymphocytic leukaemia and B cell lymphoma patients, respectively. Previously, autologous cells from individual patients used to be employed for immunotherapy to boost the immune system against diseases. Now, a new approach using donors’ cells with specific virus immunity has reached clinical trials, with the aim to create an allogenic ‘off-the-shelf’ immunotherapy product. Mr. Sando indicated that the future lies in CART or CAR-NK cells, i.e. genetically engineered cells to possess specific antigen receptors and be able to attack cancer. 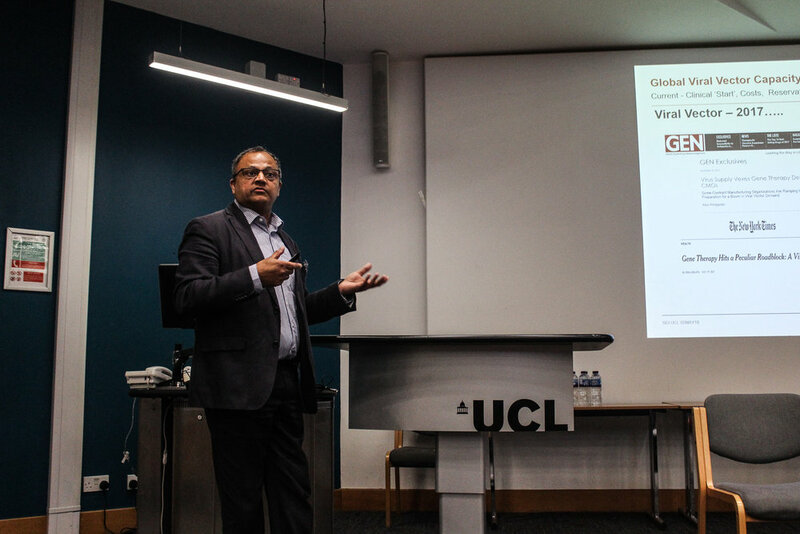 The next speaker was Dr. Martin Pule, who is the founder of Autolus – a spin-out from his lab in UCL. He showed an example of how the future of science progresses towards interdisciplinarity. Dr. Pule has a degree in haematology but he also developed a strong interest in programming and electronics. He explained how some leukaemias were so difficult to treat with conventional therapies, such as chemotherapy, which also resulted in high levels of toxicity. These days, scientists are looking for agents that could selectively target cancer cells. T cells- effector cells of the immune system- detect disregulated cells, but cancer cells can develop mechanisms to avoid T cell recognition. Dr. Pule won a Fulbright scholarship to work in Texas, where his team genetically reprogrammed the patients’ T cells to target cancer cells. Treatment in vitro seemed to be quite successful, however the same was not observed when they were administered to the patient. In order for treatments to work better, he suggested that the solution also lies on allogeneic CAR-T cells, which is a brilliant example of the combination of biology and engineering. As a general advice for the PhD students in the audience, Dr. Pule suggested that synthetic biology is the next frontier. The third keynote speaker was Dr. Bo Kara, who is the Head of Process development of Cell and Gene Therapy Platform CMC at GSK. He illustrated the complications in manufacturing and supplying engineered cells. Firstly, there is a lack of manufacturers for cell and gene therapy, so there is a need for industrialisation for production of such technology. Furthermore, the cost per dose is high. Some companies are trying to move the process from adherent to suspension cells to improve the production and to scale-up manufacturing. This seems to be able to reduce the costs and make the process more robust and consistent. However, there are difficulties in making homogenous products and maintaining of genetic stability, which are challenges that must be addressed. Dr. Jacqueline Barry, chief clinical officer at Cell and Gene Therapy Catapult, explained the company’s efforts in making the UK the number one country on cell and gene therapies. Last week, they opened the Cell and Gene Therapy Caltapult manufacturing centre, in Stevenage. A virtual tour is available online. Dr. Barry focused on the importance of regulation, on how complex these processes are (particularly, the guidelines from the EU), and how planning in advance can help scientists to commercialise their ideas. Multiple interesting discussions arose during the panel Q&A session, and are briefly summarised here. First, fostering collaborations between academia and industry can hugely benefit the advancements of immunotherapy, since academia can explore areas with higher risk factors. Hence, when industry needs to invest in the technology, the process would be easier. 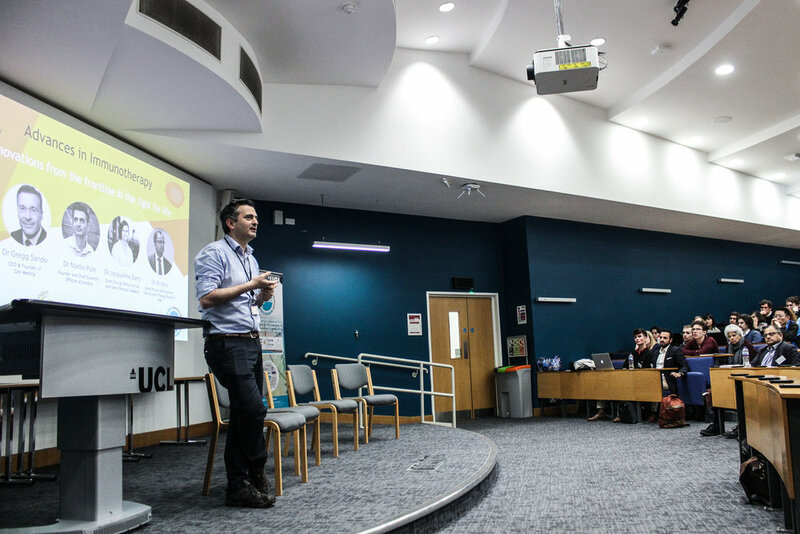 After a question from the audience about how the NHS would be able to support the costs from immunotherapy, the speaker mentioned that the cost-effectiveness analysis performed by some companies showed the benefits of CAR-T strategies over the long term. Nevertheless, it is necessary to prove to the population the effectiveness of these therapies to change the perception of these new, non-conventional treatments This would attract more funding and investment in immunotherapy. Furthermore, improving and scaling up manufacturing are keys aspects for the successful commercialization of new cell therapies. Additionally, a very important piece of advice was to always seek to patent or license new ideas, to protect the originality of the product! This SIU event was also attended by Synapse, a student-driven Danish group with complementary objectives with the SIU. The group aims to bridge the gap between academia and life science industries for students and young professionals. 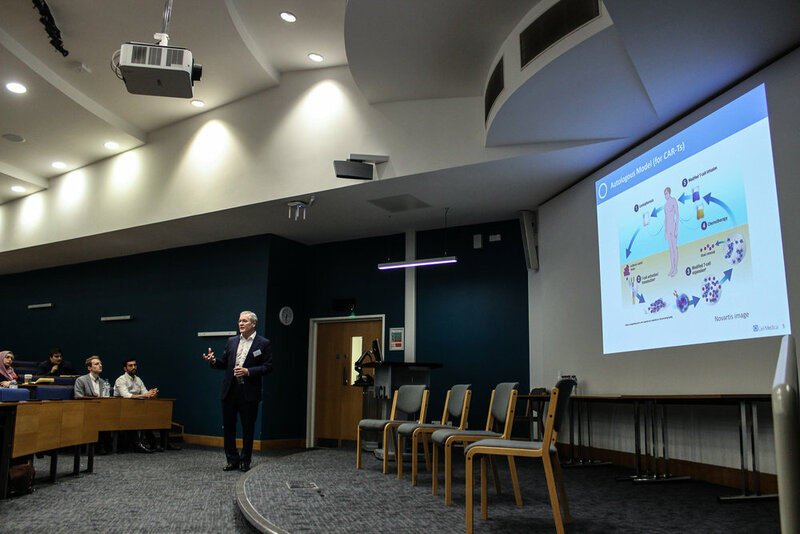 Their attendance at the SIU event was part of their agenda for the Synapse Connect UK programme, which brings their participants to explore the UK life science industry. Older PostSIUOXford: Have PhD Students Become ‘Human Pipettes’?